We are starting the 2nd quarter of the challenge! 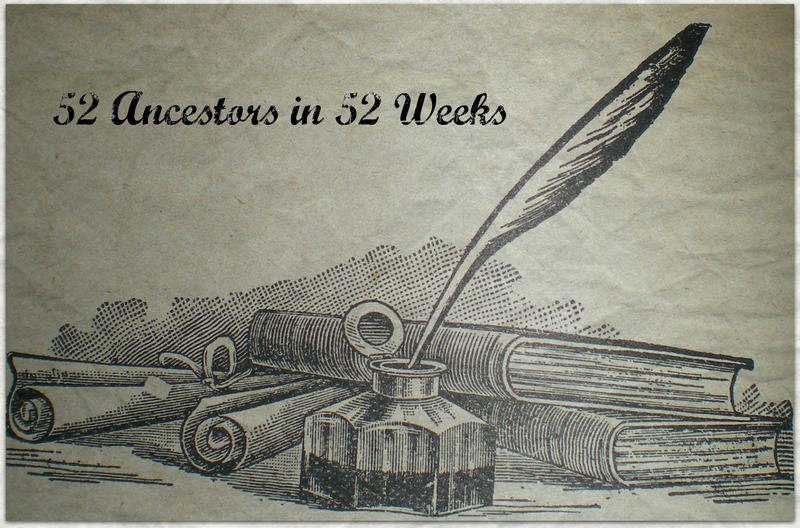 This is my 14th entry in Amy Johnson Crow’s Challenge: 52 Ancestors in 52 Weeks. My Grandfather, Joe, told about the BEEF at 200 Paces to us when I was about 10. We were shooting a rifle and he said we were as good as his dad that killed the beef at 200 paces. Apparently they had some cattle in camp to provide meat and one swam a river or deep creek and was escaping. Grandpa Alex shot it and killed it across the stream with his muzzle loader (musket?). From that point on until Alex was put in the hospital, the Captain would yell “Send the man that killed the beef at 200 paces, to the front” anytime they were firing at the enemy. Daniel CLONCH, our 2nd cousin once removed, shared the story that his grandfather Joe told him about 1941, with my 2nd cousin Robert BAKER per email on 20 May 2000. 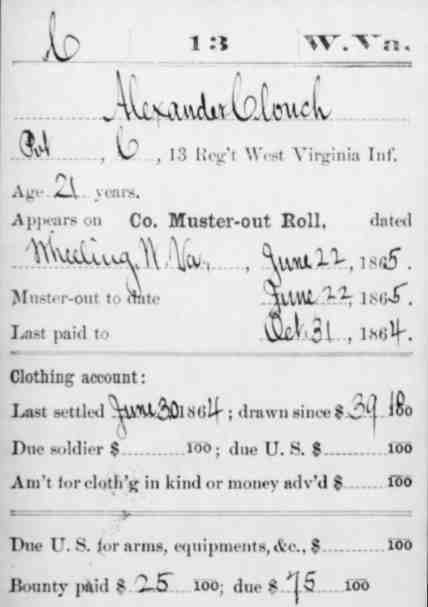 Alexander CLONCH was mustered into service as a private in Company C of the 13th West Virginia Volunteer Infantry on 8 October 1862 at the age of 21. The regiment, organized in October 1862, served in the Kanawha Valley during the first year of the war, mostly doing guard duty and scouting by detachments of companies. Alex was present until 31 October 1862. Records show that Alex was sick and absent from duty in November and December 1862. It does not give any detail as to what the illness was. His father was suffering from typhoid fever at this time and died on 20 January 1863. Alex was once again present for duty in January and February 1863. He appeared on a Special Muster Roll as present on 10 April 1863 and then on a Company Muster Roll dated 30 April 1863 as sick in Post Hospital at Point Pleasant. His stay in the hospital continued from May 1863 until February 1864 and each time it was noted that he had been there since 12 Feb 1863. After a year of being sick in the Post Hospital he appears to have been transferred to the army’s General Hospital in Gallipolis, Ohio, on 3 March 1864. This might be a bit exagerated as another source indicates that the hospital was “equipped with 350 beds, at its peak, the hospital treated 769 soldiers at a single time.” A historical marker has been erected for the “U.S. Army General Hospital” in Gallipolis, Gallia County, Ohio. Alex remained in General Hospital until the end of October 1864. Apparently he had been drawing pay the entire time that he was hospitalized as he was last paid on 31 October 1864. From November 1864 until April 1865 he was once again listed as present and I assume fit for duty. He was mustered out on 22 June 1865. His clothing account was “last settled on 30 June 1864; drawn since $39.10.” He had been paid $25 of his bounty and $75 was due him. A federal bounty of $100.00 was paid for all volunteers or regulars enlisting for three years and serving at least two years or to the end of the war. This $100.00 bonus was paid at discharge only. William CLONCH (1807-1863) and Mary E. “Polly” DOSS (1816-1890) were the parents of my great-great-grandfather Alexander DOSS a.k.a. 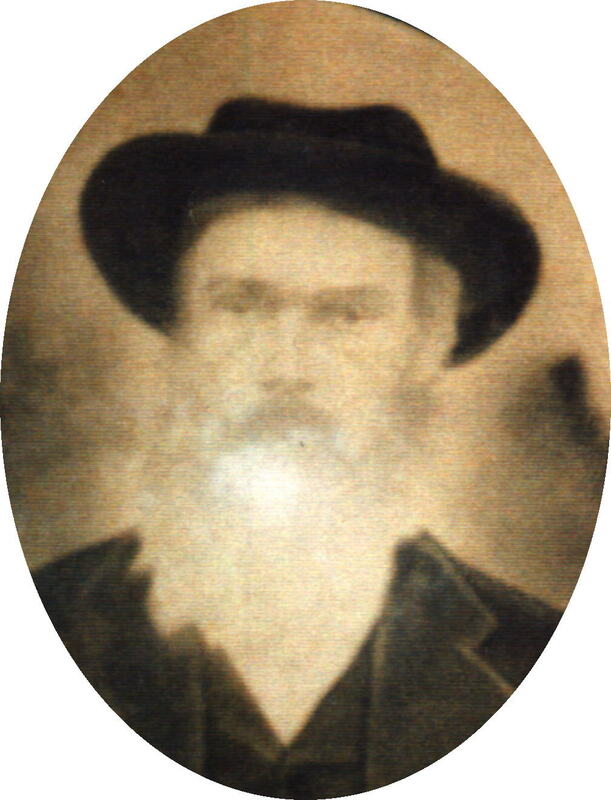 Alexander CLONCH born on 2 March 1842 in Mason County, West Virginia (then Virginia). Alex was their second child. William and Polly, although never married, had eight known children including John William (1840-1919), Alex (1842-1910), Lavina Ann (1846-1945), Jeremiah (1847-bef. 1860), Elizabeth Jane “Betsy” (1851-aft. 1899), Joel (1852-aft. 1910), Thomas Eli (1852-1913) , and Charles Henry (1855-1925). On the 1850 census we see Alex DOSS with his parents William CLONCH and Polly DOSS, older brother John W. DOSS, and younger siblings Lavina DOSS and Jeremiah DOSS. The enumerator used the ditto mark (“) to show a repeat of the surname DOSS. This is not an error as we will see later. On the 1860 census Alex, his 6 siblings and both of his parents are seen with the CLAUNCH (sic, CLONCH) surname. Note: The surname has been seen spelled/transcribed as Claunch, Clounch, Clonch, Clouch, and even Clanuch which makes the search for records a bit more difficult. As mentioned Alex’s father William CLONCH died 20 January 1863 of typhoid fever. He left a will dated the 17th of January in which he wrote, “I do wish to will my Land to Mary Doss and her Children John William Doss, Alexander Doss, Loving Ann Doss, Elizabeth Jane Doss, Thomas Eli Doss, Joel Doss and Charles Henry Doss.” William did not write “my” or “our” when he named the children in his will. All of the boys used the CLONCH surname after their father’s death. Mary DOSS also used the CLONCH name after William’s death. She had not been able to marry William CLONCH as he was still married to another woman. 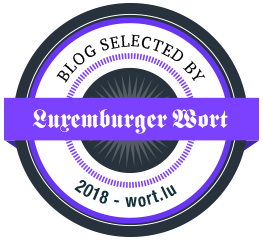 This has been discussed in A Little “Peyton Place” (Part 1) and will be looked into again when I do William CLONCH’s story for the 52 Ancestors Challenge. Lavina Ann DOSS married James William PATTERSON (1836-1911) on 16 July 1863 in Point Pleasant, Mason County, West Virginia. Her parents were listed as Wm CLONCH and Mary DOSS, however, Wm CLONCH was struck out on the marriage license. Lavina married less than 6 months after her father’s death. Why Wm CLONCH was marked out on the license is unknown. Alex’s brother John W. CLONCH married Sarah Jane FOSTER on 20 February 1862 [left page, 5th entry]. Alexander CLONCH married Mary Ellen LEMASTER on 10 November 1863 [right page, last entry]. This was when, according to the military records, Alex was sick in Post Hospital in Point Pleasant. He must have been too sick to serve in the army but well enough to leave the hospital to get married. Both of these marriages took place in Gallia County, Ohio, and neither marriage lasted. On 7 November 1865 Rebecca LEMASTER, Mary Ellen’s sister, had an illegitimate son Austin Richard LEMASTER [line 11]. His father was listed as unknown. Later this son went by the name Oscar R. CLONCH. His 1943 death record shows that he was the son of Rebecca LEMASTER and an unknown father. 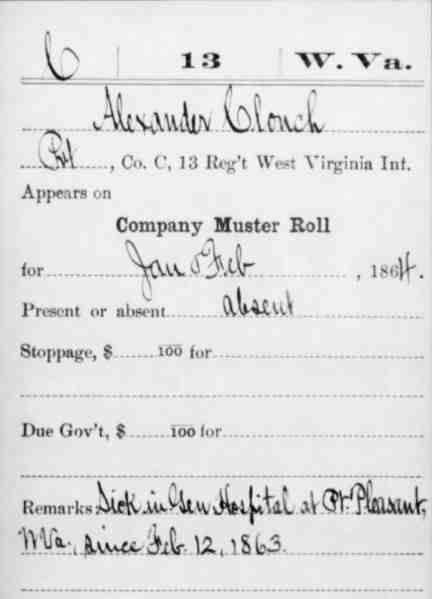 Family tradition is that Alexander CLONCH had a son named Austin and it has been assumed that the child died young as he was not mentioned in the 1898 pension papers* (more below). Most likely Alexander took on the father role for Rebecca’s illegitimate child in early years and Oscar chose to use the CLONCH surname. Alex did not acknowledge him in his 1898 pension papers*. The birth record of Alex’s son Joseph E. “Joe” CLONCH born 18 December 1874 [entry line 8] shows the mother as Rebecca CLONCH and most likely this is the reason it has been believed that the parents were married. The next child born and acknowledged by Alex in his 1898 pension papers* was Barbara Elizabeth born on 5 March 1875 (no birth record found). Unfortunately, this date cannot be trusted as it is too close to the birth of son Joe. It is more likely that she was born in 1876 as she was later seen as age 4 on the 1880 census. Last minute find (less than 3 hours before scheduled publishing time of this article): 1900 census was finally located for Barbara, her husband, three sons (previously only two sons were known) and her husband’s nephew. She was enumerated as Lizzie and her month and year of birth were March 1876! What made me look again was that her youngest son William J.’s 1943 death record showed that he was born 2 November 1900. Gallia county birth records 1894-1903, however, show that he was born 2 November 1899. I searched for this child in the 1900 census and found the family! The 1870 census listing has not been found for Alexander CLONCH or Rebecca LEMASTER nor has a marriage record been found for them. At one time someone came up with 13 May 1864 as the date of marriage for Alex and Rebecca, however, I have not found documentation, i.e. West Virginia or Ohio Marriage Records, to prove it. I do not believe that Alex actually married Rebecca with whom he raised four children: Oscar, Emma, Joseph, and Barbara. Rebecca may have died before 1880. I suspect that Rebecca may have died before 1880 (as no record has been found for her) and, having such young children, Alex may have seen it necessary to get a divorce from his estranged wife so that he could legally marry. He was seen as divorced in the 1880 census with his children Emily, Joe, and Barbara in his household. Austin or Oscar has not been located. Enumerated by me on the day of June, 1880. R. J. Neale, enumerator. Ch 1: Timothy CLONCH born 20 December 1881 Arbuckle District, Mason County, West Virginia [line 7]. He died before 1898*. Ch 4: Bertha CLONCH (1887-1898) born 9 December 1887 Arbuckle District, Mason County, West Virginia [line 14]. She died before 1898*. The Weekly register. (Point Pleasant, Va. [W. Va.]), 09 March 1887. Chronicling America: Historic American Newspapers. Lib. of Congress. This is the first time I’ve heard that Alex owned a corn mill. More research is needed to determine if this is our Alex CLONCH. It is possible that his cousin John Alexander CLONCH 1842-1889 or his nephew/son-in-law William Alexander CLONCH 1862-1925 may have used their middle names in business matters although both have only been seen as farm laborers or farmers. 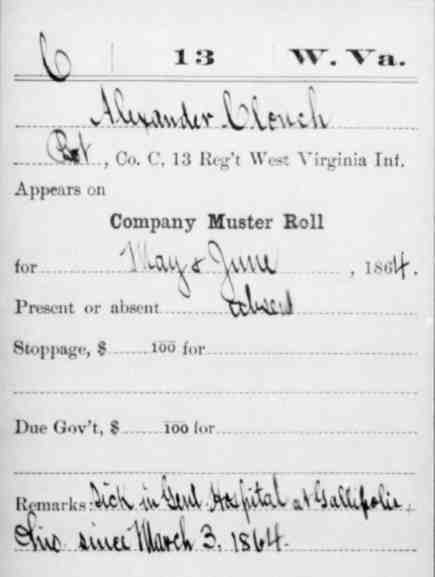 The following month, on 14 April 1887, Alexander CLONCH applied for his Civil War pension. The Weekly register. (Point Pleasant, Va. [W. Va.]), 30 May 1888. Chronicling America: Historic American Newspapers. Lib. of Congress. 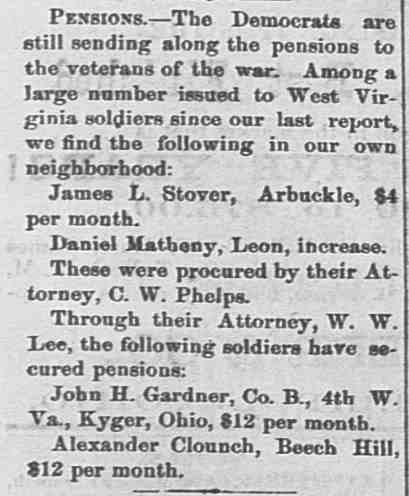 In May 1888 the Weekly Register published a list of veterans of the Civil War who were living in the neighborhood and had been recently issued a pension. Alexander CLOUNCH of Beech Hill was listed with a pension of $12 per month. The Wheeling daily intelligencer. (Wheeling, W. Va.), 23 April 1890. Chronicling America: Historic American Newspapers. Lib. of Congress. 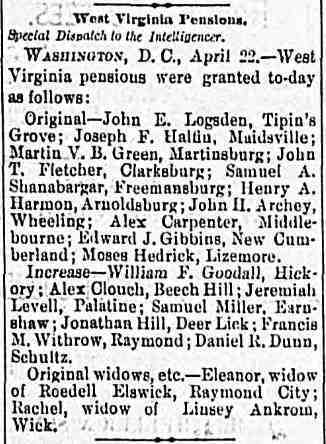 The Wheeling Daily Intelligencer published a Special Dispatch concerning West Virginia pensions on 23 April 1890. In this dispatch, we see that Alex Clouch (sic) of Beech Hill was granted an increase in pension. Alex’s mother Mary E. “Polly” DOSS died in Mason County, West Virginia. This event took place after the 1880 census and before 29 Apr 1892 when her children sold the land left to her in William CLONCH’s will. By 1893 Alex and his young family had moved to Bell Creek, Clay County, West Virginia. Although his son Harrison was born in Beech Hill, Alex had the birth recorded in Clay County which leads me to believe that the move took place soon after Tabitha gave birth. They were in residence in Clay County as the marriage of Alex’s son Joe took place on 29 August 1894 at the home of the groom’s parents in that county. Also while living there Alex and his wife had a daughter who lived only a week in October 1894. Info from Mrs. W.F. Machir, Anne Christy and Kara McWilliams. Kara McWilliams received a copy of his records. I requested more information from Kara McWilliams, a niece of Daniel CLONCH, concerning her copy of Alex’s Civil War records. She will be getting back to me as soon as she has time to access her genealogy papers. I am hoping that there may be information that was missed. If she sends me images of the papers I might be able to read the information she was not able to decipher. It must be noted that not all of the dates given by Alex for the children match birth records found. Was Alex Clonch a Bigamist? This is the most important detail that I noticed in Alexander’s pension records (transcript seen above): married previously to Rebecca Lemasters (deceased) on 13 May 187_ (cannot read). This must be where the marriage date 13 May 1864 came from. So many questions and no way to ask the person who could answer them! Why would Alex marry Rebecca when he was already married to her sister? Why would he get a divorce from Mary Ellen in 1880 when (if) he married Rebecca in the 1870s? Although Alex left a nice paper trail up until 1898, I have not been able to locate him in the 1900 or 1910 census. This is really frustrating as it means that I have no census listing showing Alex with his wife Tabitha and their children! As with the census, I’ve tried all variations of his name in order to find his death record on WVCulture.org but to no avail. 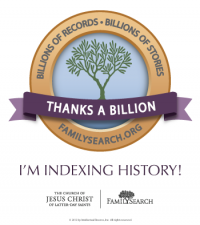 Finally, I found a database on FamilySearch that is 80% complete and Alexander CLONCH is in it! The Veterans Administration Pension Payment Cards, 1907-1933 [images 579-582]. These cards have information missing in earlier documents and, best of all, his date of death. Alex’s disability was disease of the heart, resulting from measles. Did he have the measles while he was serving during the Civil War? His widow Tabitha continued to receive his pension following his death and their youngest daughter Ida, being a minor, brought in an additional $2 per month until 4 March 1912, the day before her 16th birthday. Alexander CLONCH died 9 June 1910 and was buried in Clonch Family Cemetery, Mount Olive, Fayette County, West Virginia. His wife of 30 years, Tabitha Ann “Tobitha” COOLEY, followed him on 16 December 1913.